I've had a few comments that my posts have been long lately. I've just felt the need to share some background on my struggles with adrenal fatigue and food sensitivities. So anyone else out there that might be struggling can have hope that they can get better. I'm getting better and I'm a pretty severe case. Anyway- this one is going to be short and SWEET. 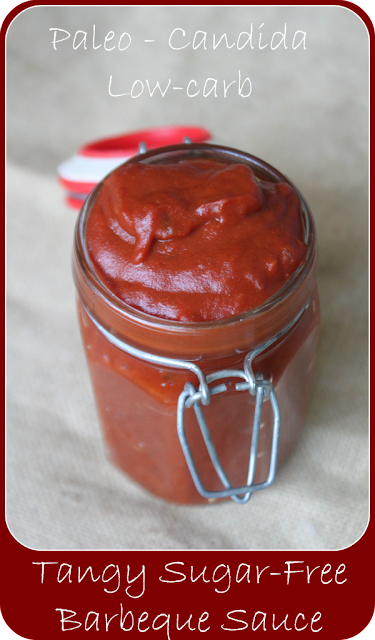 A quick recipe for a sweet and tangy barbecue sauce that is deliciously whole and clean. And sugar-free. So even us restricted Candida dieters can have it. Yay! Its super simple to make and even my kids didn't mind it. I've included a few modifications for those not on the Candida diet. Hope you enjoy it and get out there grilling this weekend. I will be dancing and celebrating my brother's wedding. Temptation will be all around but I'm going to stay strong. And bring lots of snacks and pre-packed meals for the festivities. And I'm not eating one perogy. He actually put me in charge of the cupcake stand (refills) - I think he's trying to torture me. Cruel. This will be the ultimate test of my will. Wish me luck! Fry onions and garlic over medium heat in butter until softened. Add spices and let cook for a couple of minutes to let the spices "wake up". Add strained tomatoes, vinegar, liquid amino's, Worcestershire and Stevia. Reduce heat and simmer for about 20 minutes until all flavors are blended. Add guar gum and mix thoroughly to thicken further - if desired. Let cool and use to baste meat when grilling or use as a sauce on meatballs. Hi I'm sorry but how much of the strained tomatoes, don't see it in the ingredient list. Thanks! Do you have a recipe for coconut vinegar? Sorry I don't. I buy the bottled stuff. How long does this stay good for in the refrigerator?